I’m back from chairing the jury at CIMCL, the Lyon International Chamber Music Competition. 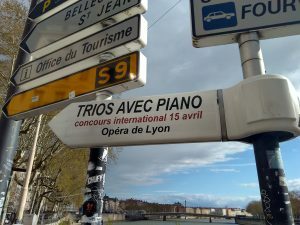 It was won by the Trio Messiaen from Paris, who swept the board with almost all of the available prizes. In 2nd place was the Trio Hélios, also from Paris, and in 3rd place was the Trio Mosa, who live in the Netherlands but study in Paris. At drinks following the gala concert in the Lyon Opera House (see photo), a few people said to me it was a curious coincidence that the top prizewinners were French. I can honestly say it was nothing to do with their nationality. They won because they were the best and would have impressed us anywhere. Having said which, it was noticeable that many of the candidates were from France, or studying in France. But as one of my fellow jurors said, you can only win a competition if you go in for it in the first place! So I hope groups from more countries will enter this fine competition. As well as offering generous prizes, it also has prizes for career development, and to support educational projects. I still have the notes I made while I was listening to the candidates. Most of those notes have not been useful to anyone other than me, because not many people asked for feedback. Completely understandable, because their opportunity to ask for feedback came immediately after discovering that they had been eliminated from the competition. Few people wished to speak to members of the jury at that moment. Some stepped forward bravely, but it was obvious that they were not really in the mood to hear our comments. So if anyone wants to ask for feedback from me, let me know. I’m going to keep my handwritten notes for a week or so. On my home page, just beside my little photo in the left hand margin, there’s an opportunity to ‘click here to send an email’. This entry was posted on Tuesday 17th April 2018 at 1:25pm	and is filed under Musings, Travel. You can leave a response, or trackback from your own site.